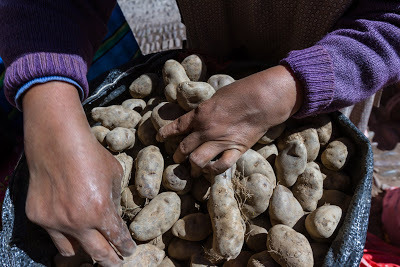 A woman sells potatoes at a market in the Andes. DNA analyses show that ancient populations of the Peruvian highlands adapted to the introduction of agriculture in ways distinct from other global populations. Potatoes, native to South America, became an agricultural crop thousands of years ago in the Andean highlands of Peru. 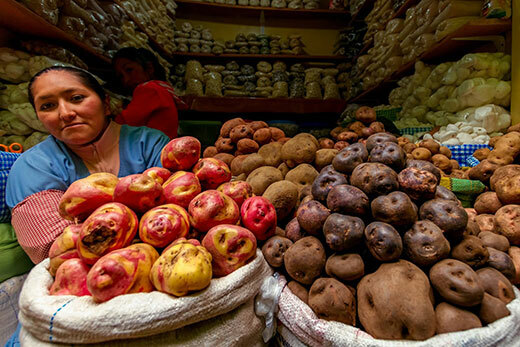 And just as the ancient Andean people turned wild tubers into the domesticated potato, the potato may have altered the genomes of the Andeans who made it a staple of their diet. Science Advances published the findings. DNA analyses show that ancient populations of the Peruvian highlands adapted to the introduction of agriculture and an extreme, high-altitude environment in ways distinct from other global populations. In contrast, European populations that began consuming more grains with the rise of agriculture show different genomic changes. Research has shown that their genomes have an increased number of copies of the gene coding for amylase — an enzyme in saliva that breaks down starch. Lindo, an assistant professor of anthropology at Emory, integrates the approaches of ancient whole genomes, statistical modeling and functional methods into ancient DNA research. The international team of 17 researchers also included Anna Di Rienzo of the University of Chicago (who specializes in physiology and genetics) and high-altitude archeologists Mark Aldenderfer, from the University of California, Merced, and Randall Haas, from the University of California, Davis. The study looked at seven ancient whole genomes from the Lake Titicaca region of the Andean highlands of Peru, dating back from 1,800 to 7,000 years. The researchers also compared the ancient whole genomes with 64 modern-day genomes from both highland Andean populations and lowland populations in Chile, to identify genetic adaptions that took place before the arrival of Europeans in the 1500s. harsh environment of the Andean highlands. Both the ancient and modern high-altitude populations showed strong positive selection on variants in the MGAM gene, which is evident by at least 1,800 years ago. That fits with archeological evidence indicating that the domesticated potato — a crop resistant to cold that grows mainly underground — became a staple of the Peruvian highlands as far back as 3,400 years ago. The researchers also discovered that the Andean highland population’s genomes do not share the same genetic changes previously seen in Tibetan genomes in response to hypoxia, or low levels of oxygen. That suggests that the Andean genomes adapted to high altitude in different ways. One possibility uncovered in the study is differentiation in the DST gene, which has been linked to proper cardiac muscle in mice. DST histone modifications in the Andean genomes associated with blood and the right ventricle of the heart may correlate to the tendency of Andean highlanders to have enlarged right ventricles. That finding fits with a previous study suggesting that Andeans may have adapted to high altitude hypoxia via cardiovascular modifications. A gene flow analysis found that the low- and high-elevation populations split between 8,200 to 9,200 years ago. The arrival of the Spanish in South America — who brought new diseases, along with social disruption and war — coincided with an estimated reduction of 90 percent of the total Andean population. The current analysis, however, showed that the effective breeding population in the highlands went down by only 27 percent. “We found a very strong selection in the highlands population on an immune gene that has been correlated with smallpox, which may have had a protective effect,” Lindo says. The harsh environment of the highlands, he adds, may have also buffered them from the devastation seen in the lowlands. “Understanding the diet, environment and historical events of various ancestries, and how those ancestries adapted to these factors, may be one way to understand some health disparities among different populations,” Lindo says.